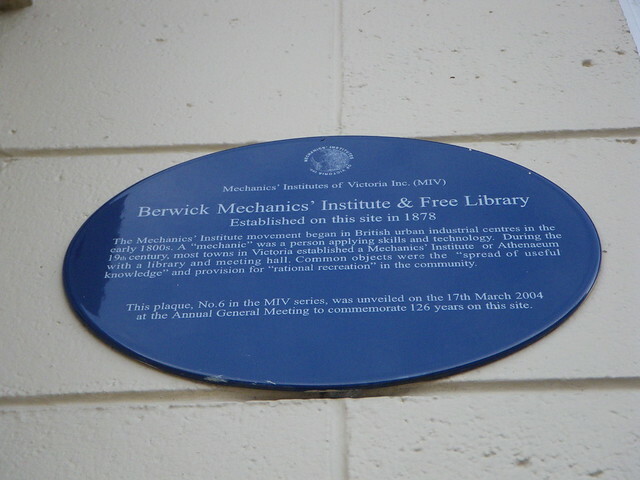 Berwick Mechanics' Institute & Free Library. Established on this site in 1878. The Mechanics' Institute movement began in British urban industrial centres in the early 1800s. A "mechanic" was a person applying skills and technology. During the 19th century, most towns in Victoria established a Mechanics' Institute or Athenaeum with a library and meeting hall. Common objects were the "spread of useful knowledge" and provision for "rational recreation" in the community. This plaque, No. 6 in the MIV series, was unveiled on the 17th March 2004 at the Annual General Meeting to commemorate 126 years on this site.